A great ambassador for the game as a player and administrator, Hobbs played 21 times for his country - four as captain - between 1983 and 1986, scoring four tries. He later became chairman of the New Zealand Rugby Union and, in that role, he played a major role in securing the hosting rights for last year's Rugby World Cup. He served on the IRB Council as a New Zealand Rugby Union representative from 2002-2007. During his time on Council he was a member of the IRB Executive Committee and Chairman of the IRB Regulations Committee. 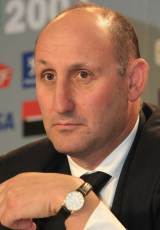 In all, he was chairman of the NZRU from 2002 to 2010, as well as being Chairman of Rugby New Zealand 2011. He stood down from both roles in May 2010 due to illness. Hobbs was present at the Rugby World Cup Final in Eden Park to witness Richie McCaw lifting the Webb Ellis Cup and, the following day, he won the prestigious Vernon Pugh Award for Distinguished Service at the 2011 IRB Awards ceremony in Auckland. Hobbs sadly died on March 13 after losing his battle with cancer.